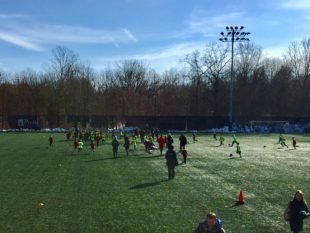 Tryouts for Philadelphia Union’s inaugural Junior Pre-Academy have begun. PSP contributor Scott Pugh shares his perspective as his young son goes out for the team. We didn’t talk about it much. I wasn’t sure how he would react. Being only seven years old, he’s never been in a real tryout before. I told him we were going to play soccer at YSC. No big deal. He’s done it before with YSC’s “Little Kickers” starting at age three, continuing with “FUNdamentals,” and then the “Player Development Program.” Every experience he’s had at YSC has been positive and the philosophy of coaching young kids at the complex has been evident for me from day one. It’s always been high quality and fun. So when my son was lucky enough to get an invite to try out for Philadelphia Union’s new Juniors Pre-Academy program, I knew this was something we wanted to check out. As the tryout day approached, he asked more questions about the program and he started to get excited–especially when he figured out that the Pre-Academy could lead to entering the Academy. He quickly put two and two together and figured out that was how Derrick Jones got to the first team. The Union have hit it out of the park. Mark my words. This group of 2009 and 2010 boys that are beginning their journey through the Union youth Academy system will bear fruit for the club. Expect to see a big increase in home-grown talent in about ten years. It’s been two years since I wrote a series on how much of soccer in the US is still struggling to catch up with a multitude of research on best practices for youth development, especially at the critical formative ages of 7 to 11, or what many now refer to as “Zone 1.” Listening to Iain and Tommy discuss the program was music to my ears. “I’d take ’em all if I could,” Iain said in his charming Scottish accent. Bingo! He knows that not only is expanding the “base of the pyramid” critical to developing the best players, but that there is no way to predict which players at age seven will become the best at age eleven, fourteen, or eighteen. The Union Pre-Academy will seek to build an environment conducive to fostering development. That means a few things – kids will be given freedom to make mistakes, absolutely critical to developing creative players. They will spend more time playing the game and less time focused on tournaments and competitions where adults care more about win/loss records and rankings than the kids do. The vast majority of the coaches hold either a UEFA Pro License or a USSF “A” License, the highest certifications available to coaches. Not only that, but they recognize the importance of preventing burnout and injury that can occur in single-sport children. The program will include a multi-sport winter season where the focus will be to broaden the players’ athletic ability overall. According to the Pre-Academy website, “Our objective is to provide a fun and nurturing program that develops a long-term passion and love for the game.” The players will strive to become better not because they are told to, but because they want to. “Kids respond to challenges, not threats,” Iain said. It nearly brought a tear to my eye. It’s exactly what a parent wants to hear, and exactly what a soccer-pediatrician-data-nerd like myself has been saying for years, despite often being met with criticism from the “old school” soccer guys. The Union’s new Pre-Academy looks to me like the best place in the country to develop young soccer talent. I kicked a piece of ice around the ground myself two Sundays ago surmising, surfing the grounds watching the kids play that day mine amongst them; looking for and at talented little footballers. Who sees it differently. Who controls. Who makes others better. Who dares to dominate. I appreciate the need to win now for some Union people and Union fans. Full Stop. I appreciate MORE the opportunity to have a kid who loves the game learn in an environment tailored to excellence and self expression. I recognize fully the birth and growing pains likely to accompany this endeavor. I trust it will be fantastic. This is a massive undertaking and 100% without question in the best interest of US Soccer. Hopefully, not long from now a full complement of little Pre Academy kids once or twice or three times a year will descend in Orlando or Anaheim or some other magical kingdom and square off against each other… fly to distant lands and display the true birth of US Soccer greatness. It is coming. It is coming. I tip my hat to your little boy for his courage. I hope he is among those selected at this crossroads- or maybe another along the way. Blessing. Same to yours. It really is an exciting program and makes me confident for the future of US Soccer. Nice article but couple things to mention. First of all: Derrick Jones played with my son at LMSC and went from LMSC to the Union. His main development occurred on fields without grass while growing up in Liberia. 2nd of all: kids develop differently. Some will get into the pre-Academy and do great for a couple of years, then falter and get cut. Others will not make the pre-Academy, will end up playing for LMSC or Continental or other travel team and then do great at U14/U15 and will get into the Academy. It is all a crapshoot. Looking back the key thing my sons got from travel were the amazing friends they made and the fun they have playing in College. But these days with the Academy, kids get cut left and right and many kids become insecure because of this ‘will I be cut next’ hanging over their heads. It is great for those who always do great during their whole youth career but many don’t. Wish your kid all the best and hope he will have plenty of fun and become the next Pulisic! Comments noted Guido- a few points of rebuttal. I think from the perspective of a 7 year old, how Derrick Jones got to the first team, was Academy. That’s the point of the marketing aspect of all this by Union HQ. I think you and me and the author know the timeline. The question is…does it really matter relative to a little boy who tells his dad, I want to be the next Derrick Jones. Secondly, I have found the ingrained try out experience at some unnamed local clubs to be as ~ if not more cutthroat and political ~ steeped in a ‘this kid is part of the cliche but this kid is not’… so I’m also not too sure that matters in this instance as well. Do not believe there will be ‘cuts’ in Pre Academy save the annual opportunity to trial and play yourself either into or out of the pool and as with all things that will likely be meritocracy based. Who is spending time getting better outside the setting versus the who is not spending the time getting better outside the setting. Correction: unlike all things this will be merit based. The best youth coach in England was couple days ago on TalkSport and he talked about why England has not produced many more stars to help England win something. He talked about all the great organized programs they have that prioritize fun over wins & losses but said they do not replace what used to happen in the parks and school playgrounds. He said that this was the fundamental reason why Messi and Neymar are world stars and why England does not have anyone even close. One of the reason why my youngest one is killing it in College is because he started to play Futsal when he was very young. Boy, do I miss those fustal tournament at the Wildwood conference center!! Good stuff Scott. My son was also there for 2008 tryouts, and I left impressed too. It was particularly good to hear that they encourage other sports at this age, and would work with families there. Great read Scott!! All the best to your lil Slugger! How cool too​ that he sees the path to first team! Keep the hope and dream alive for him! Again all the best to you and your family! Both of these concepts are massive for kids. If they are on the path to greater success in the sport, they will benefit from the freedom of not playing non-stop tourneys. They will also develop skills and strengths by playing other sports. And then there is the obvious and well-documented orthopedic advantage to multiple sports for kids. These two points give me great hope for the future of player and personal development. If a kid stops playing when they are 12-16, at least this path will increase the likelihood that it is for a better reason than burnout and too much pressure from the LaVar Balls of the world. Good luck to your boy. Sounds like he’s already having fun, which is always paramount at his age. With all due respect to these very salient points… there are cultural and worldview aspects at play beyond simply stating LaVar Ball puts too much pressure on his kids. For every story 15 years down the road a young adult retells of an overbearing parent there are likely three stories that relay the importance of a necessary mentality a parent helped instill whether that kid went on to professional athletics or overcoming obstacles in life…. just so happens he had a forum for wider view. The idea of LaVar Ball is more about the parent who is living vicariously through his child, and who does not have the child’s best interest at heart. I’m all for strengthening a psyche and mentality. I’m not for selfish advancement of an adult suffering from Peter Pan Syndrome. So I understand fully, the issue is with the LaVar Ball you have seen on TV…not the ‘LaVar Balls’ of the world which is being generalized. He’s not a unicorn. There are many parents like him throughout the world, and especially here at home. My first memory of the uber-parent was Marv Marinovich. That worked out well. There are positive examples, as well. But they are usually the people who don’t seek the spotlight for themselves. Sounds like a great program, but where does that player pool come from? Kids playing at YSC in Wayne? Is there any equivalent for kids north of the city? In the city? Just curious. IN the city? No chance. My understanding is that they can come from anywhere. I believe once they hit the true US Development Academy ages, then some US Soccer and/or MLS rules might define the catchment area. Now – not many parents would be willing to drive from South Jersey 3x/week, so it does limit things a bit. There are more and more clubs that are trying to do things with a “development first” mentality, and there are many that are offering scholarships to those that can’t afford it, but we’re still a long way from providing equal opportunities to all kids in the US. In fact, there’s no where else in the US where this type of program exists in connection with a professional team to this extent as far as I’m aware. That being said, I believe Derrick Jones was playing for Lone Star FC (?) in the city at the time the Union found him. correct; Derrick Jones was playing for Lone Star and LMSC. But looks like they start only at U11. My sons played on teams where parents drove their kids 1.5hrs to and 1.5hrs back from practice! This is not uncommon on top teams. Thanks for the answer. To the other comment about driving, I get parents driving kids an hour or more to and from teams, but it seems, again, like it’s ruling out all but the affluent. I’m not trying to criticize. It seems like the Union has methods to ID kids from other places/socio-economic circumstances. I’m just not sure what they are. Hopefully, in time there is a satellite in the city. an old abandoned warehouse. multiple open futsal courts. if I had a couple million I’d be building it as we speak. Philly Futsal no loner there. Anthony left. Not to mention…boy I felt it was expensive. Anthony brought Philly Futsal back to KoP this past winter. — This is so great to hear… this is what the next generation of American player needs. Soon this will be the norm, and that’s exciting. I wish your son and all the other kids, the best of luck! Yeah, I agree. Same with Pulisic. Once kids believe that “one of us” can do it, they get some belief. Just the fact that my redhead, Main Line kid believes that he could be just like Derrick Jones is super cool in my book. Interested to hear about the “invites” were decided. Any idea? I have all girls, so I’m removed from that process. I know that at least one local club was not thrilled about the program. One of the parents with boys in that age group told me that club sent out an e-mail with veiled criticism of the YSC program. Looks like someone’s position on youth soccer tryouts is evolving. Haha. Not exactly. If you read the article, I highlighted Iain Munro’s main point “I’d take ’em all if I could.” And he’s not just offering platitudes. Tryouts themselves weren’t the main problem in my 2015 series. It was tryouts intended to find the best kids at that time with a focus on who would win the coach the most U8 games. Instead tryouts (like what the Union Pre-Academy is doing) should be focused on 1) finding the right fit FOR THE CHILD, and 2) looking for long-term potential over current size/speed, etc. But thanks for reading my stuff!! Rest assured, I did read the entire article. Regardless of what Iain Munro said, or what you think he believes in his heart, the fact is that the Union Pre-Academy officials are only going to offer positions to a select group of young players judged most likely to succeed in their program… a practice you were highly critical of just two years ago. Don’t you think it’s a little unfair for you to attribute the most noble of intentions towards anyone associated with Union Pre-Academy – because YOU think its best for YOUR child – while making broad assumptions that coaches involved in other youth soccer programs have a win-now, win-at-all-costs approach to the game? I think you’re unfairly oversimplifying my position. Where have I ever said that Union Pre-Academy is the only one doing it right and everyone else is doing it wrong? I was very clear in my previous series that lots of coaches/clubs in the area are “doing it right,” but there are just as many that still place an emphasis on winning now (perhaps driven even more by parents than coaches), more than on the development of the kids. Again, I am not “highly critical” of using tryouts to select kids likely to succeed in a program. I am critical of how you define that success. If you mean which kid is going to win you games this season, then yes, I’m critical of that goal. If you mean instead, which kids are going to fit the level of play, work hard with a positive attitude and potential for growth, then yes, tryouts are necessary when there are limited resources. Sure, in a perfect world, every kid who wants to play soccer should get to play in a nurturing environment with quality instruction. solid rebuttal…waited patiently, choosing not to put words in your mouth. Is this program free for those selected and intended to supplement club soccer or does it come at a cost and is instead of playing for the clubs? Not free. Maybe someday. Think training comp and solidarity may one day change that at this level and maybe others. My understanding is the price is commensurate with local travel… not inexpensive local, local travel and not top price point travel. It is not a supplement as I understand as well. I do believe kids will be afforded the opportunity to play with local clubs though as a guest. Regarding: Anthony and Philly Fustal. Can you expand. I was up at Competitive Edge quite a bit this winter didn’t see anything and nothing seems to be on line. Thank you. My son was also there that day and your words mirror my own. I was so impressed from start to finish that I want my son to be in this program no matter what. I am so disappointed with every other program in the area unfortunately and wish more focus was placed on recognizing a child’s skills and improving upon them instead of just throwing kids on a field in a game with no direction or organization. I don’t see how that helps the kids learn and become better than they were before they joined the league. I realize it is very possible that my son will not be selected. There were soooo many talented children at the tryouts and he hadn’t played in a few months. He didn’t play his best but at least he had a great time. I just know in such a program as this that he could be so much better. He has the skills and the drive…he just needs an environment where he can actually grow and develop. Kudos to the Union Pre-Academy. If Dom(my son) is not selected this year, be sure we will try again next. I went through this about 10 years ago with my daughter. YEs the Union started a similar program back then and it was open to girls as well as boys. In the 10 years since (my daughter was not selected) she has blossomed into a player now being recruited for college. The program is a smoke screen to get identified players into the club by calling it an open invitation. If you have attended a YSC training session or played in one of the indoor leagues you get an invite (not sure if this specific tryout was at a cost but ours was back in the day). THe Union or YSC or whatever “Official” name needs to provide the appearance of equal opportunity by offering the tryout. For the most part, just like ODP and the CFC and PF programs the spots are “reserved”. True that some gems may be discovered is also the purpose of casting a wide net. of the 170 there to tryout how many will be selected, then take into account that 75% of the pool is already identified before the tryout. When call backs happen (my daughter made it through a few rounds) you will see new kids show up with each round. One other thing to take into consideration, the Union Academy scouts are also sourcing through the city to find athletes and offer them the scholarships. Soccer, just like any sport has a “type” and that “type’ is determined by the club, if you look at the make-up of the academies, players like Christian Pulisic are an anomaly. So while I am sure your boys enjoyed the day of soccer it would be interesting to see which players made it through and then track where they are in 10 years. To one of the earlier posts, players migrate to where they will play and parents whether wrong or right will get there little Johnny or Sally to teams where they will play, good soccer parents will do the same but also look at the level of training. My daughter had drive and determination to make it to one of the better teams in the area, as a parent I supported her and had some knowledge and understanding that the combination of being on a team that can win, with a coach that can train is good, but to get to the next level she needed to want to work. There is also a huge network in the Philly area for soccer that funnels players between the preps and the academy teams. If you make one you make the other. Within this question are actually solved many times. Training is great but this program has very few elite players. Some kids don’t know how to do things as simple as throw ins at 9 years old. Club teams with good coaches offer same training. Played first games this week and my son’s team had coaches I never saw during the first 2 weeks of training nor did those coaches have any interaction with my son’s team until 20 minutes before their game. He had a different coach for each of his first 2 games which for me isn’t good for a young player. They accepted a massive amount of kids. Many of the coaches already knew the kids. My son was one of the kids no coaches knew and although after watching he appears to be one of the better players at this point, it’s just not what I expected from the talent end of things. Each age group should probably cut 1/3 of the kids they kept.